It's all in the name. CoNetrix Tandem software is an online solution that helps ease the burden of regulatory compliance. We have done the research up front so you can be compliant with information security regulations in much less time. Don't labor over extensive language and making sure updates are made to all the right documents. Let us work in Tandem with you so you can accomplish your compliance goals. 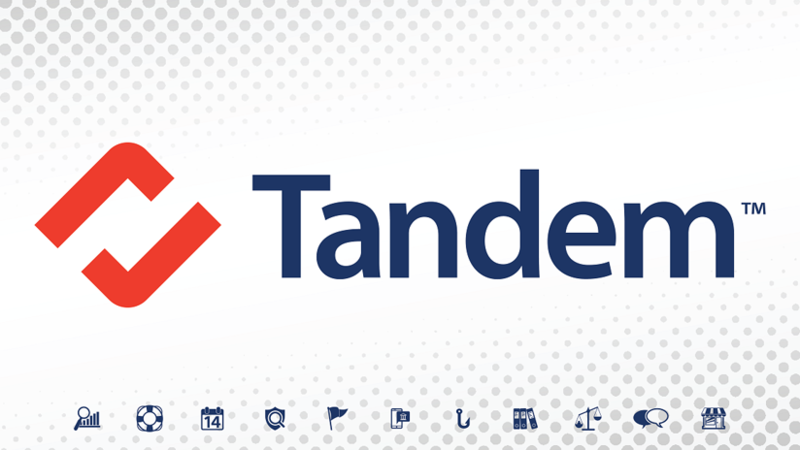 Tandem software was built specifically for financial institutions (banks, savings associations, credit unions, and trust companies) to help increase security, stay in compliance, and lower overhead costs. We understand bank employees, especially for community banks, are asked to wear numerous hats, and with the continued increase in compliance burden, it is hard to keep your balance. In the past, we have primarily assisted banks with their security and compliance needs through expensive consulting, but now with CoNetrix Tandem software, you can save time and money without sacrificing information security, cybersecurity, or compliance. CoNetrix Tandem Audit Management software is designed to help financial institutions (e.g., banks, savings associations, credit unions, mortgage companies, trust companies, etc.) manage, track, respond to, report, and conduct any type of audit or exam. The Tandem Audit Management software features multiple versions. Audit Standard allows full access to the finding and response manager for entering and tracking the status of responses for any type of audit or exam, including recommendations, responsibilities, and due dates. * A complimentary version of this product, Audit Lite, is provided with every CoNetrix audit (limited to tracking CoNetrix security engagements). Audit Pro builds upon the finding and response manager of Audit Standard and allows full access to the audit manager tool which gives the ability to create and conduct audits, including work programs and work papers. Business continuity and disaster recovery are critical for any company, but especially for financial institutions (banks, savings associations, credit unions, and trust companies). A good business continuity plan (BCP) should help a company or institution avoid losses as well as return to normal operations as soon as possible if an adverse event or disaster were to occur. CoNetrix offers online business continuity planning software to facilitate the development and maintenance of a Business Continuity Plan/Disaster Recovery Plan, following FFIEC, FDIC, OCC, FRB, and NCUA guidance. Use the software to prepare for adverse events such as natural disasters, biological pandemics, technological failures, human error, terrorism, and cyber-attacks. Financial Institutions (banks, savings associations, credit unions, and trust companies) have extensive regulatory requirements and compliance tasks. The CoNetrix Tandem Compliance Management software helps you identify, schedule and track important dates impacting financial institution requirements including reporting, audits, training, operations, and compliance. CoNetrix developed an online software tool to help financial institutions, such as banks, credit unions, mortgage companies and trust companies, complete and report on annual and recurring compliance events. The Tandem Compliance Management module is available in two versions. Compliance Management Free helps financial institutions keep track of regulatory and compliance events. Compliance Management Pro builds upon the free version with additional features, including additional download options, document storage, an additional access role, and bulk import capabilities. The FFIEC released a Cybersecurity Assessment Tool to help financial institutions identify their risks and assess their cybersecurity preparedness. CoNetrix developed an online software tool to help financial institutions such as banks, credit unions, mortgage companies and trust companies complete and report on the FFIEC Cybersecurity Assessment Tool. The CoNetrix Tandem Cybersecurity module is available in three versions. Cybersecurity Free is an electronic version of the FFIEC Cybersecurity Assessment Tool. Cybersecurity Pro builds upon the free version with additional features, including additional documents, document storage, access roles, and the ability to copy assessments. Cybersecurity Pro + Boost Consulting not only includes all software features, but also provides personal training and consulting services for your employees and Board of Directors. On November 9, 2007, the Agencies jointly issued final rules and guidelines to implement Sections 114 and 315 of the Fair and Accurate Credit Transactions Act of 2003 (FACT Act). These rules require financial institutions (banks, credit unions, trust companies, mortgage companies) and creditors to develop and implement a written Identity Theft Prevention Program to detect, prevent, and mitigate identity theft in connection with covered accounts. Additionally, the rules require financial institutions to establish policies and procedures to assess the validity of a change of address. CoNetrix offers online software to help create your Identity Theft Prevention Program document, along with customizable employee training for Identity Theft Red Flags. Our software follows the FDIC, OCC, FRB, NCUA, and FTC (the Agencies) red flag rules and guidelines and enables you to efficiently create a complete Identity Theft Prevention Program. On June 28, 2011, the FFIEC issued a supplement to the Authentication in an Internet Banking Environment guidance released in October 2005. The purpose of the supplement is to reinforce the guidance's risk-management framework and update the FDIC, OCC, NCUA, and FRB’s (collectively, the Agencies’) expectations regarding customer authentication, layered security, or other controls in the increasingly hostile online banking environment. CoNetrix has developed an online software to help financial institutions (i.e., banks, credit unions, savings associations, etc.) go through the risk assessment process and provide customer awareness and education. The Tandem Internet Banking Security Program is a stand-alone software module integrated with the Tandem Security & Compliance online software. The Internet Banking Risk Assessment features an easy process with a questionnaire to identify risk levels and help you assign layered controls to mitigate related Internet banking and cybersecurity risk. Your risk assessment is customizable based on your financial institution's unique situation. The Customer Education/Awareness Program will provide your financial institution with the tools to deliver education and security awareness to your customers. In addition, the Tandem Internet Banking Security software will provide you with account takeover (ATO/CATO) template documents to assist in your annual reporting to the board and documenting of incident response procedures. As part of employee training, the Agencies (FFIEC, FDIC, OCC, NCUA, and FRB) directed financial institutions to encourage employee awareness and preparation for a variety of social engineering attacks, including phishing email scams. According to the FFIEC Information Security E-Banking Booklet, phishing is "a digital form of social engineering that uses authentic-looking—but bogus—email to request information from users or direct them to fake Web sites that request information." Just as technical security is necessary for cybersecurity, employee education plays a role in maintaining cybersecurity. Only employees can save themselves from being victims of a phishing email cyber-attack. Policies and procedures are the primary method financial institutions (banks, savings associations, credit unions, and trust companies) use to define controls. Too often, after they are developed, they end up sitting on a desk and collecting dust until the next exam. CoNetrix offers an online solution to help you create and maintain your enterprise-wide policies in Tandem. The Tandem Policies module is populated with an Information Security Policies set, created by CoNetrix security experts and tailored for your institution through a multiple-choice questionnaire. Content for more than 50 recommended policies, designed to be in compliance with information security and cybersecurity regulations. Template policies include: Change Management, Core Application, Electronic Banking (e-Banking), Incident Response, Intrusion Detection and Prevention, Mobile Devices, Social Media, and Wireless Network Access. The ability to define verification items for each policy and combine the items into meeting agendas for your various committees (e.g., Audit Committee, Security Committee, etc.). In addition to the Information Security Policies set, you may use the Tandem framework to maintain all of your financial institution’s policies. Add your own policy language and assign user access based upon unique categories (e.g., Human Resources, Lending, Operations, etc.). Use global reporting to generate standardized documents, such as an enterprise-wide Acceptable Use Policy (AUP) or your full policy set, ready to share with your employees, auditors, examiners, and Board of Directors. The Gramm-Leach-Bliley Act (GLBA) and the Interagency Guidelines Establishing Information Security Standards require financial institutions (banks, savings associations, and credit unions) establish an Information Security Risk Assessment. CoNetrix offers an online risk assessment software solution to help banks and credit unions perform an information security risk assessment, per GLBA, as well as individual information asset risk assessments. We designed our software using guidance from the FFIEC, FDIC, OCC, FRB, NCUA, and CFPB. Our web-based risk assessment software is designed in an easy-to-follow format. A threat questionnaire broken into eight sections to assist in quantifying the likelihood and potential damage associated with threats. On December 11, 2013, the FFIEC released a guidance on behalf of the FDIC, OCC, FRB, NCUA, CFPB, and SLC titled "Social Media: Consumer Compliance Risk Management Guidance." The guidance is intended to help financial institutions understand potential compliance, legal, reputation, operational, and other risk associated with social media. As part of the guidance, it is suggested each financial institution have a risk management program to identify, measure, monitor, and control risks related to social media. Manage your social media profiles with one login. Create a custom review process for authoring, scheduling, and approving posts. Publish to all accounts from one secure site. Track and limit employee access to your social media accounts. Monitor social media sites for posts about your financial institution. The Risk Management Program helps develop and manage your financial institution's social media compliance and risk management program, including governance, policies and procedures, third-party management, employee training, oversight, audit and compliance, and reporting. The Publishing tool allows you to create, approve, and manage your social media posts to multiple outlets from one location. The Monitoring tool allows you to track and monitor information posted about your institution.